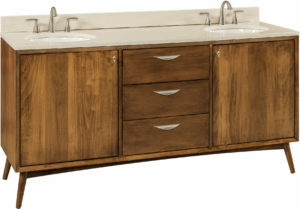 The sink collections lineup below from Brandenberry represents custom-made, solid hardwood bathroom furniture at its best. Finally you can make your bathroom as upscale as the rest of your home. Plus Amish artisans built them all. So they’re very sturdy, durable and long-lasting. 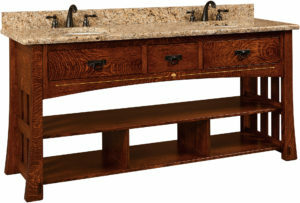 Presenting the perfect bathroom vanity and sink for your home. Just choose one of the great-looking, top-performing pieces above from Brandenberry Amish Furniture. The sinks represent different styles — from classic to modern. So you’re sure to find an ideal match for your other furniture. Also, you can choose from different arrangements of drawers, cupboards and open shelves. 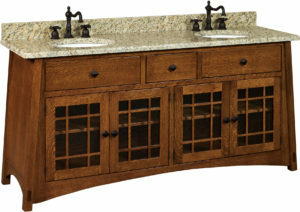 So the bathroom sinks fulfill your needs for bathroom storage. 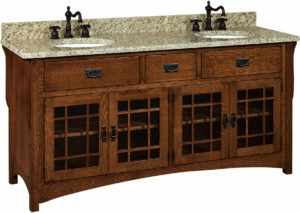 Plus the vanity with single or double bathroom lavatories are ready for your choice of countertops and faucets. Amish cabinetmakers handcraft each unit shown. And they use solid hardwoods. Like oak, maple, cherry and hickory. So with proper care, the bathroom sink you choose should last for generations to come. 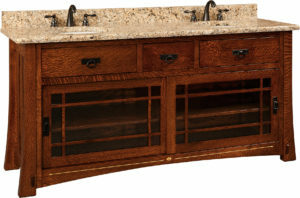 What’s more, you can match the bathroom vanity or available corner bathroom sink with a bathroom mirror from Brandenberry. You’ll find them in Bathroom Accessories.